Without an iota of a doubt a TRUE PATRIOTIC statesman and a star leader leading from the front. Please post dailymotion video...it says SAMAA TV has blocked the content due to copyright infringement. Every speech by Imran Khan is better than the previous one, and gives more and more hope and optimism. He talks from the bottom of his heart and it feels like that too. Pm imran Khan will ensure very good salary package for civil servants in 2 - 3 years. Shahzad arbab is very competent and he has delivered in FATA reforms. It's the confidence that gives real meaning to his words....he's not just PM, he's a charismatic leader. We have seen some major change in his attitude and body language in just 26 days and it's very positive and encouraging. May Allah help him, our invaluable country and it's citizens. Khan morale bandy ka asmaan p le jata h koi b ghaur sy suny tou. Bhains ke age been baja raha hai. 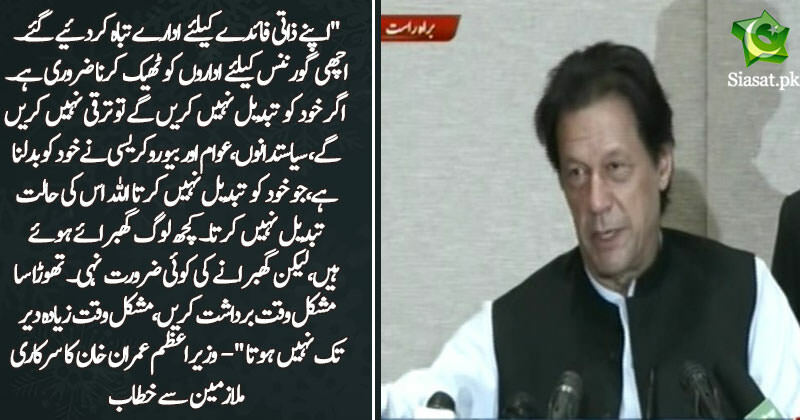 Pagal ho gaya hai Imran Khan. These haramkhorz alone has so much corruption money sitting in their houses that we can pay for bhasha dam with it. Remember that one secretary from Baluchistan (a small province). Imagine what these haramkhorz made in Punjab and Center. There is no other way. Imran is democrat not dictator.